Last half-an-hour shocker for the bulls. Will the effect continue ?? The day began on a surprise note. The three day pattern before that had indicated tremendous weakness and it looked like NIFTY is going to fall and no one had second thoughts about it with US markets also tanking the previous night. But contrary to everyone’s expectation, the markets bounced and infact rallied strong moving past all the resistance levels till it reached the last resistance level of around 3056 indicated yesterday. 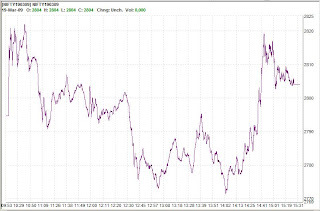 As soon as it reached that level, there was a very strong pull back and NIFTY futures lost around 50 points and almost touched 3000 levels at one time within the last half-an-hour. Now let us analyse that move. 1. Is this move an indication of what is in store in the coming days? Are we going to see similar pull backs that are very strong. 2. Is this to frighten the late entrant enthusiastic bulls who were willing to enter at 3050 levels for the fear of missing this rally and just shrug them off. 3. Is this move just to reassure the bears that they are in the right position, or is it a false reassurance ? The overall move suggests that bulls are still very much under control and might give up only on a strong move below 2915. Bulls have the upperhand, but bears might take control in the short term. The good thing about today’s pull back is that, it has become very easy to set the stop loss level for shorts. Any move at this stage above 3056 and 3080, will see bears looking for cover similar to last expiry and can push NIFTY further above to test 3150 and subsequently 3250 in the short term. The resoning is that a move above 3056 would nullify the “shocker” effect for the bulls, even for the late entrant ones and would prove points 1) and 2) above to be wrong and would prove 3) to be true, i.e bears were given a ‘false reassurance’ and so had to run for cover. So given this scenario, tomorrow’s trade will be very significant. This is the last chance for bears to take some control and if they give up, bulls will rise ferociously to an extent which we wouldn’t have seen. Let us have a very close eye on how it spans out. The best strategy now is to ‘Sit and Watch’ ?! 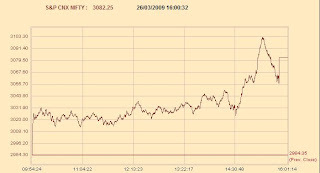 After a very strong March series expiry and another day after the expiry in which hopes were built in that 3000 levels of NIFTY will be held strong, yesterday saw a major dent in the sentiment. The three day pattern as it is, denotes an extremely bearish move, but my take would be it may not be as bad as perceived (because of yesterday’s fall). 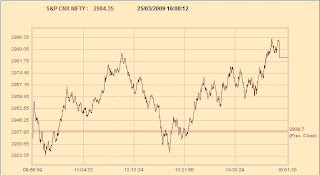 Support exists at 2950, 2885 and 2856 should act as a very strong short term suport. On the other hand 3003 is now established as a resistance level followed by 3031 and 3056. Shorts may be accumulated at higher levels, as NIFTY has to see some more retracement if at all it has to resume its upward journey. Being the financial year end, neutral view is maintained for today also, as it will be too early to confirm this is really bearish and also it is dangerous to go long when the rally has been overextended. It is better to stay in the sidelines. A remarkable bull series in March and what to expect further in April ?? It was rather a remarkable expiry for the bulls in the march series, touching a high of 3100 levels. Also the theory that bulls are very much in the driver’s seat for the expiry and not even a single bear will take home profits if the position is left as it is proved to be right. Now that march series is history, we need to look forward to the April series and the question is how will the April series span out. It is already one day since we have traded for the April series which was also controlled by the bulls. But will it sustain? or is it just that everyone should close their books on Mar 31 for the year end and so will keep it high to show profits or rather a reasonable loss when they do a Mark-to-Market. It is but quite natural that bears will be waiting to take revenge and hereafter any one down move will shake even the strong bulls as the rally has been significant from 2500 levels and is also moving wide from its 20 and 50 DMA. So before we can conclude on the further course of action, it would be better to let other players decide or rather fight it out and chart something in that course for us to decipher. Till then it would be a wait and watch kind of situation. What did the food for thought imply? We should not be making any first moves, but rather interpret them and react to that. Last but not the least, thanks for reading the ‘food for thought’ atleast thrice !! Above 3000 levels? Will that be a reality for this expiry?? This has been the longest streak that I can remember, where the view remained “Bullish” throughout without even having a single “Neutral” or “Bearish” day and for the expiry day also the Bullish stance is powerfully maintained. For two days, we saw some retracement towards the end of the session and the intra-day bulls or the late entrant weak bulls were all thrown out, but at the same time, the end of the day bears never had a chance to exit. Today there was a strong bullish move towards the end and even the intra-day bears didnt get a chance to exit. What does this imply for the expiry? End of the day bears have been trapped in this move all along from 13th march. So is it even possible for a single bear to make money in this expiry if the position is left as it is? I doubt and this is the theory that has been maintained all along right from the 13th and throughout the last week, when even 2950 seemed to be a reachable but very distant target. 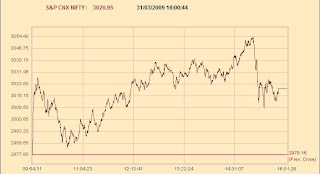 The fact that bulls deliberately did not cross 3000 levels today and again have trapped weak bears signifies the fact, that the expiry is going to be above 3000 levels and I wouldn’t be surprised if the NIFTY series expires at 3075 – 3100 levels. The key levels for tomorrow’s session being 3020, 3056 and 3077. 2972, 2956, 2939 should provide the required support and in any case the view is that it will not go below 2915 levels. Also note this entire move could be to completely trap the bears waiting for October lows to be broken and we can see a reversal for the NIFTY April series. How significant is today’s retracement for March expiry?? 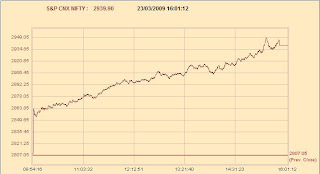 NIFTY lost significantly today after reaching 3000 levels. 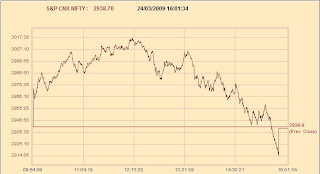 Though the retracement seems significant from the intraday point of view, it is very much insignificant when compared to the long white candle made on 23rd March session. It is still very much in bull zone. Only on a further dip and close below 2868 levels will the bullish stance be reversed for this expiry. Till then there is always a possibility of 3000 levels to be broken again on the up side and a further move towards 3056 – 3100 levels is very much possible. Reached our target of 2950 for March expiry. What next ?? 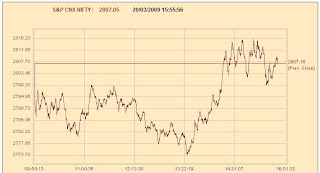 NIFTY made the strongest move today in three months and reached our target of 2950. When I wrote the blog, Is 2950 a possible target for March expiry ?? on 18th March, I didnt expect it to reach 2950 this monday itself. Today’s move confirmed the theory that bears are totally trapped for this expiry and going forward, I dont expect NIFTY to retrace much before expiry. In fact the bullish view is so strong currently that even a target of 3110 – 3150 may not be ruled out for this expiry. Are Bears completely trapped for March expiry ?? 1. Why are you so bullish from this level and why is it not possible for a reversal from this level. My simple answer to this is that we have seen a high of around 2830 (NIFTY futures) in this month and even the worst bull is now sitting with a mere loss of 22 points. Just imagine the plight of the bears sitting at a loss of 250 odd points and hoping for a reversal. Also there are other evidence that points to vested interest in this expiry being at higher levels and it is evident from the fact, though NIFTY managed to complete the day with a doji, 8 out of 10 heavy weight index stocks are in the red. Using ONGC for the short squeeze, bulls have managed to place them back in a comfortable position and in the process have trapped much more bears, fresh ones which entered on friday, thinking that NIFTY is unable to cut across the ceiling of 2800 easily and so that denotes weakness. May be just to let the bears think they have an upperhand, bulls didnt over extend the show on friday and my take is that the drama will unfold in this expiry week and can push NIFTY to our earlier target of 2900- 2950 levels… with 2868 being the immediate target. This theory will prove wrong only if we see 2730 levels being touched and is broken down further to 2686 levels which according to me looks like a very, very remote possibility. Will the short squeeze seen today continue ?? Will the short squeeze that we saw towards the end of the session continue tomorrow also? This is a million dollar question to be answered and my take would be an ‘yes’ to the above question. All along today’s session, I was expecting the squeeze to happen and only that I was expecting it to happen too soon. The reasoning is quite simple. The 3 day bullish pattern of 3 white soldiers followed by a bearish day, followed by another strong bullish day was the pattern with which we entered trading today. Clearly already so many bears are trapped and we havent seen enough of squeeze happen before due to the fact that NIFTY was already near its 50 DMA and infact retraced quite a lot in the previous session to close even below its 50 DMA. Given this scenario, after a strong start markets started trending down and so fresh shorts and old shorts were all happy that they were holding on to their position and NIFTY has made the reversal. But as perceived yesterday, the undercurrent was still very much bullish as more bears have been trapped and they are the ones going to supply the money. Looks like weak bulls were also thrown out today. The close has been above the 50 DMA which is currently at 2796. 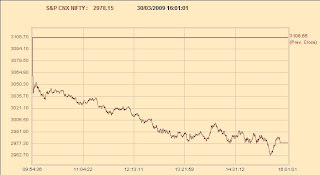 A strong close and a close above 2800 after 20 sessions. So I expect this move to continue till we reach our target of 2868 and if we see some strength at that level, then NIFTY can move on to 2950 levels even before March expiry.